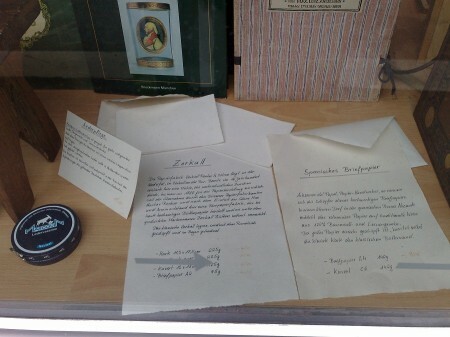 Last time I was in Germany I discovered a second hand book shop in Würzburg that also displayed stationery in the shop windows. The stationery on display seemed to be a mix of items I have seen in Lexikaliker’s blog and in Manufactum’s catalogue, but there were also a few items I have not seen anywhere else. Items I saw there for the first time included paper and envelopes from Zerkall Ingres, mouldmade in a paper mill dating to the 16th century, and cotton/linen paper from Artesanos del Papel in Alicante. 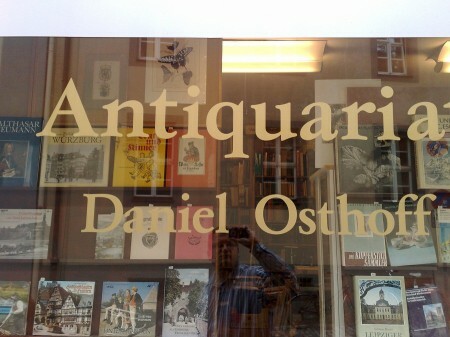 One of the items I bought in this book shop is a paper clip from OHTO, a paper clip looking a bit like a picture frame hanger. The informal name seems to be Japan-Clip. It can hold 20 sheets of 80g paper. The standard clip is nickel-plated, selling for 20c each (25¢, 16p), the posh version for 50c (63¢, 41p ) is 18K gold-plated. 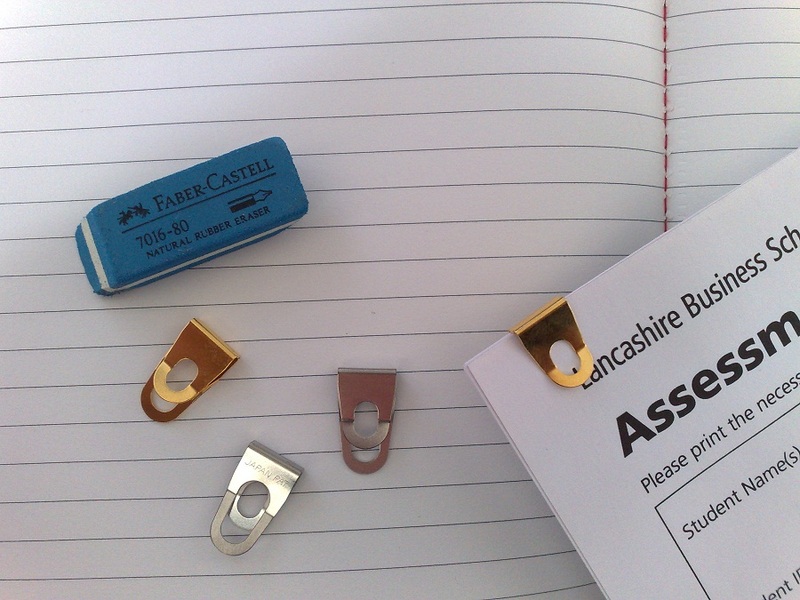 The nice thing about these clips is that they still look good even if they hold many sheets of paper, while ordinary paper clips usually look unsightly if you squeeze too many sheets of paper in. 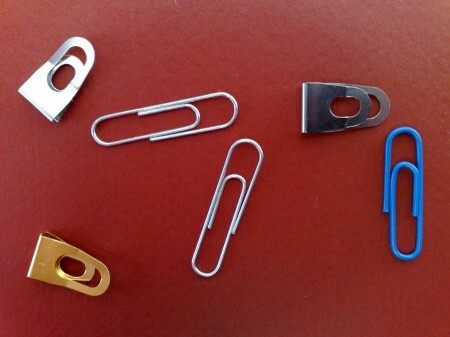 On the other hand ordinary paper clips can hold more sheets of paper and seem to be softer to the paper. When you try to squeeze too many sheets of paper (> 25) into the Super Clip it can damage the paper slightly when you remove the paper clip again. After using OHTO’s Super Clips for a while I came to appreciate them as re-usable, temporary clips that hold paper together much better and tighter than ordinary paper clips. The fact that I have two different colours helps to distinguish similarly documents I am working with, e.g. two sets of statistics from different years. I found this company selling Zerkall Ingres paper in the USA. JetPens and Cult Pens do not seem this paper clip and I could not find an American or British online shop selling the Japanese paper clip. RSVP and Modulor are two German online shops that have the paper clip in stock and ship to most countries. I would like to thank Kent and Arnie for the Banditapple carnets used in the photos. Very interesting! Thank you for sharing these details. – I wonder if there is another use of the Japan clip that employs the holes. About the holes: they might be there to enable you to keep using treasury tags (if they are popular in Japan). The look made me wonder whether being a paper clip is only one of several uses, because it just dos not look like a paper clip to me, especially because of the holes. Could it be that the holes are in exactly the right place so that you can file the clipped document in a lever file (Leitz) if you clip it on the left hand side with two clips at roughly a third intervals? The holes punched in the documents would have to correspond with the holes in the Japan Clip. Thank you for this idea. The holes are a bit too small for a proper lever arch file, but are big enough for a typical ring binder. Maybe lever arch files are not common in Japan? ..but that would be surprising. Peep into the offices in Tokyo’s administration district and you find out why. Here PCs are rare and work carries on in the slow lane. “Japanese banks, post offices, government offices, all are staffed with three to five times the employees because they must do every process once on paper and then again on computer,” says Taro Hitachi a technical editor and patent reader at Hitachi. Full Disclosure: I am with OHTO Americas. Thank you for the review and everyone for commenting! These are OHTO Super Clips! They come in a variety of colors and can be picked up in metal or plastic! We will soon begin selling them direct within the US for your readers that are not in Germany. Thanks again! I didn’t know they are available in plastic, too. How many different colours and types are there? Good that you’ll sell them in more countries. In the UK I’ve recently seen OHTO pens in shops that didn’t use to sell OHTO. Hearing now that you’ll sell the clips in the USA makes me think that OHTO tries to expand into new markets and countries, all over the world. Thanks for this. I just had a look at your web site trying to find photos of the other colours and of the plastic clips, but could only find information about pens there (good to see you sell the Tasche in the USA) – not about the clips. Most RSS-enabled sites have a comments feed, though the URL will naturally be different.